Congrats to Aura of Genesis on receiving her GOLD classification! Arno van het Nieshof x Amina NTF This fantastic mare epitomizes the modern haflinger that we breed for at Genesis Farm. 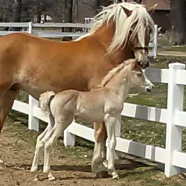 Aura is bred to Gold Classified Niagara yes for a 2015 foal. 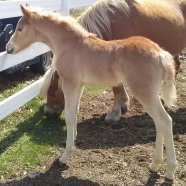 Foal is available for sale in Utero! Back from the National Futurity! 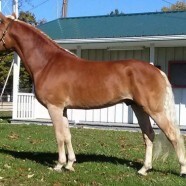 Introducing Imported B line stallion Bravado! 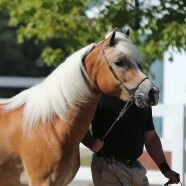 Bravado was introduced to the public at the AHR stallion parade in Ashland last weekend. 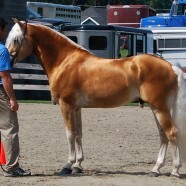 This Modern uphill stallion is co owned by Wingspann Farm and Genesis Farm! 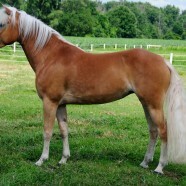 He is sired by the great producing B line stallion Barolo and is out of the Elite mare Oliena! Bravado will stand at Genesis Farm for the 2014 Breeding season! Aura of Genesis takes AHR Best of Show!